I hope all my Canadian readers out there had a wonderful Thanksgiving. Ours was a busy one with 4 soccer games, 2 classes, our final stamp-a-stack planning meeting, kids movie night and then yesterday the much deserved turkey dinner! A full weekend with family and friends - what more can you ask for! Our bewitching Nite Owl Digital Kit includes everything you need to create a cauldron full of eerie Halloween projects! 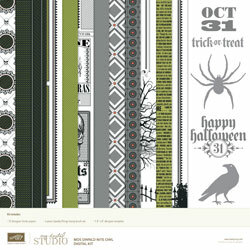 Set includes 12 Designer Series Paper patterns, Spooky Things Stamp Brush set (5 pcs), and an 8" x 8" designer template. 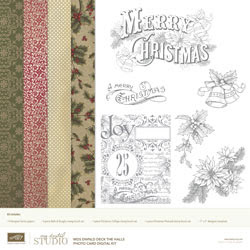 Digital Designer Series Paper coordinates with traditional Nite Owl Designer Series Paper from the Holiday Mini 2010 catalog. Frightfully beautiful coordinating colors are: Pear Pizzazz, Tangerine Tango, Basic Black, and Basic Gray. Our vintage-inspired Deck the Halls Photocard Digital Kit evokes the dignity and refinement of Christmases past. Photocard kit includes four Designer Series paper patterns, Bells & Boughs Stamp Brush set (4 pcs), Christmas Collage Stamp Brush set (1 pc), Christmas Postcard Stamp Brush set (1 pc), and 7" x 5" designer greeting card template. Coordinating colors are: Cherry Cobbler, Soft Suede, Very Vanilla, Always Artichoke, and Crumb Cake. Create your own party favors with our Celebrations Digital Kit. Loads of festive elements in bold colors, including 12 Designer Series Paper patterns, Celebrations Stamp Brush set (8 pcs), Celebrations Pennants Stamp Brush set (4 pcs), embellishments (17 pcs), one 7" x 5" designer greeting card template, one 4.25" x 5.5" designer greeting card template, and one designer template consisting of two 12" x 12" pages. Two stamp brush sets coordinate perfectly with strings of pennants and individual pennants. Have you ever wondered if Christmas would be even merrier if you could create your own Christmas photo card? 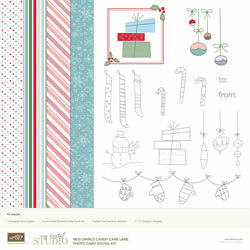 Well, now you can with our Candy Cane Lane Photocard Digital Kit! This heart-warming kit includes four Designer Series Paper patterns, A Cute Christmas Stamp Brush set (9 pcs), Candy Cane Embellishments (3 pcs), and 7" x 5" designer greeting card template. Festive coordinating colors are: Garden Green, Baja Breeze, Blushing Bride, and Real Red. Set of 15 color-drenched brads provide the perfect finishing touch for your autumn projects. 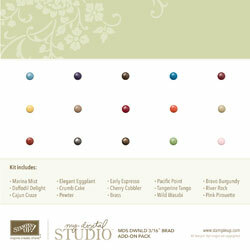 Together with the brads already included in your My Digital Studio software, this Brad Add-On Pack rounds out the offering for the Brights, Neutrals, and Regals Collections. Colors are: Bravo Burgundy, Cajun Craze, Cherry Cobbler, Crumb Cake, Daffodil Delight, Early Espresso, Elegant Eggplant, Marina Mist, Pacific Point, Pink Pirouette, River Rock, Tangerine Tango, Wild Wasabi, Brass, and Pewter. This gorgeous kit will remind you of a golden Thanksgiving Day -- or a stroll through Paris on a crisp autumn afternoon! Includes eight Designer Series Paper patterns, Day of Gratitude Stamp Brush set (7 pcs), and French Foliage Stamp Brush set (6 pcs). 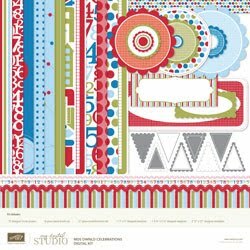 The kit also comes with two designer templates: the first is an 8" x 8" designer template spread (2 pages within one template); the second is a 4.25" x 5.5" designer greeting card template. Colors are: Cajun Craze, Old Olive, More Mustard, and Early Espresso. Have you heard that we also have a My Digital Studio blog? Check it out here. Lots of great inspiration and tips - definitely worth visiting on a regular basis. Octobers Creative ARTwork Kit only available until Oct. 22!